Tens of thousands of people will head to Eastern Market this weekend for the Detroit Festival of Books. Now in its second year, this event brings together bookworms of all ages to peruse a huge selection of both new and used books. There will be 200 vendors on site selling used, rare, antiquarian, and unusual books, as well as new books from local authors. In addition to all of the great books, you will also find vinyl records, comic books, vintage board games, and other unusual items. Plus DJ Zig-Zag will be there playing funk music, and there will be food trucks, and beer! There is definitely something for everyone at this event! 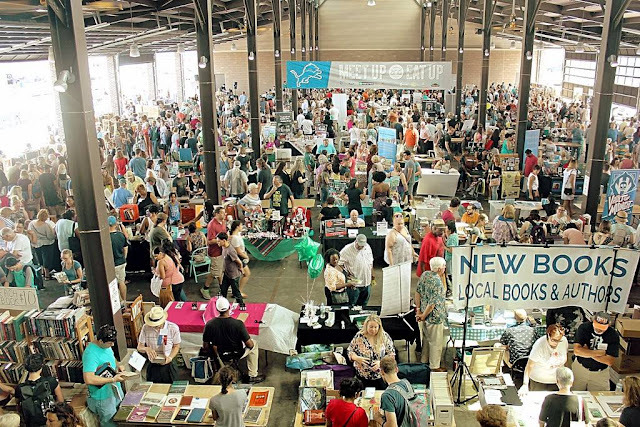 The 2nd Annual Detroit Festival of Books will take place this Sunday, July 15th in Sheds 5 and 6 of the Eastern Market. Admission is free and the event runs from 10 a.m. until 4 p.m. Make sure you come hungry because The Nosh Pit Detroit, Nu Deli, Big Dog's Hot Dogs, Detroit Gourmet Nut Company, Cosmic Burrito, and Cherry Pit BBQ will all be on site. After bookfest wraps up, head over to Eastern Market Brewing Company for the official after party. Admission is also free for the party, and there will be live music and good times once you're inside. For more information on the after party, click here. Don't miss this awesome event this weekend! To get more information on the Detroit Festival of Books and to find out what vendors and authors will be at the event, "like" the fest on Facebook here and RSVP to the Facebook event page here.